Home/Swing Dancing/West Coast Swing/From Fly Fishing to Fly Dancing Dude! The Jubilant Jesse Brummett didn’t grow up dancing, but now can’t imagine his life without it. Born and raised in the same Bend, Oregon home until college, Jesse first discovered dance at his local hometown bar during college summer break in 2015. He was there for a birthday party, and thanks to the offered dance lessons, he became hooked. That hometown bar still holds such a special place in his heart, that he longs to go back and frequent it regularly.At his beloved bar Jesse learned Country Line Dancing, Country Swing, Country Two Step and later picked up Night Club Two Step and (what would soon become his favorite), West Coast Swing (known as WCS). He later added Brazilian Zouk, Bachata and fusion dancing to his repertoire after moving to Southern California. Since then he has been out dancing almost every night of the week for over three years, literally 5-6 nights on average! He currently devotes about 2/3 of his (social) dance time to WCS and the other 1/3 to Brazilian Zouk. Since those initial bar lessons, he has been learning from a mix of group workshops, intensives, practice groups, You Tube videos and private lessons to clean up his technique. Jesse has such a passion for dance and learning that he has already begun teaching a bit. Primarily at his school to help cultivate a community of dancers there. He would like to do more teaching in the future. Apart from a younger cousin who dances ballet, Jesse is the only other person in his immediate family who’s into dance. Nonetheless his family his supportive of his newest found passion. The dances next on his list that he’d like to learn are Blues and Argentine tango. He’s contemplating kizomba dance, but is on the fence about it as it “feels a little weird and boring”, he quipped. Jesse has ambitions of helping to grow a crossover scene amongst the Zouk and WCS scenes (aptly named “Swouk”). He sees himself running weekend Swouk events including socials, workshops and more someday. While personally he aspires to continue improving his dance abilities while also becoming a better, more well rounded person. Jesse credits dance, in part (particularly Zouk), with teaching him better connection skills. And speaking of connecting, while Jesse has only made one serious romantic connection on the dance floor thus far, he still finds it easier to meet people in the dance scene than outside of it. This is due to social dance providing easy ways to break the ice and quickly get to know others. Adding that one is guaranteed to share something in common with a romantic interest met while dancing, and it’s something that couple could share and do together. When asked what dance means to him, Jesse explained “Dance is very important to me and has changed my life drastically. Growing up, I had few friends and mostly did things with my parents. I stayed busy with extracurricular actives, but didn’t connect with peers very well. Dance has taught me so much about human connection and interaction, by putting me outside of my comfort zone. 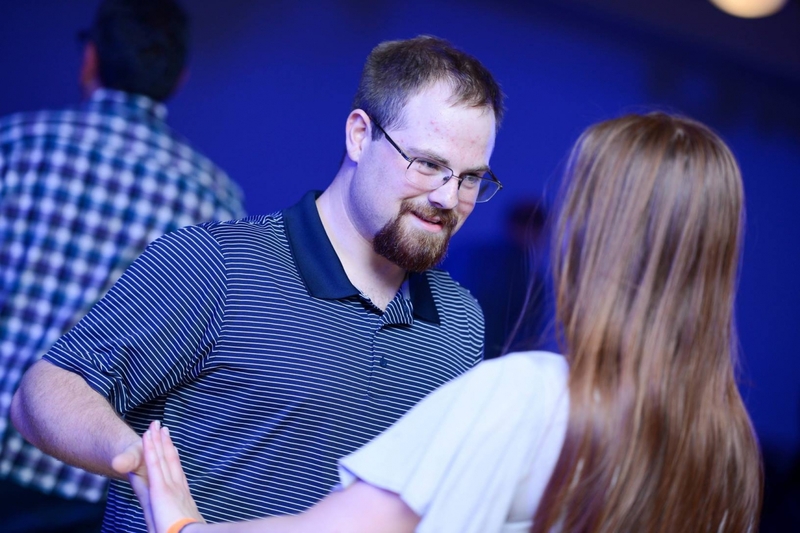 I am so much more confident, driven and happier now than I was before I started dancing, and even have improved relationships.” Jesse also credits dance with keeping him in shape physically, while keeping his mind active and challenged. Another benefit he added, is having learned so much about his body and how to move. Those who don’t notice the compression brace on Jesse’s left hand wouldn’t necessarily know that he has recently battled health issues. First, he had month long bronchitis that made it difficult to exercise without feeling as if he was coughing up a lung, forcing him to sit out many dances until he recovered. Then to top it off, he was diagnosed with a rare case of Reactive Arthritis that is not only painful, but made it very difficult to stand at times, let alone dance. Since then he has been able to increase his time dancing while decreasing the time that he’s out injured. While he admittedly struggles with this new (sometimes painful) normal, he continues to strive to fully regain his strength and mobility. While others would view this diagnosis as a reason to cease activity, Jesse views it as a challenge to work through in order to continue doing what he loves. Jesse marvels at the powerful healing effects of dance that continue to enrich his life and help him grow stronger. Now a bonafide dance addict, Jesse is a regular at ATOMIC’s West Coast Swing socials on Thursday’s. He enjoys the variety of the crowd at ATOMIC, affirming (that) “There are always dancers from other styles at such a variety of levels here. It makes it really fun, and I am always meeting new people.” Known far and wide for being among the friendliest dance spaces, Jesse, the fly fisherman turned connection King fits in like home. Something people would be surprised to learn about you? With a Fly Fishing Guide for a father, Jesse became quite the fisherman. He is still learning where to go in So. Cal. Also a musician, Jesse plays Bass Clarinet. He also did Track and Field for 4 years, focusing on the throws.